What’s the difference between play and innovation? Both are structured, normally voluntary activities that arise from imagination and explore the limits of the possible. Perhaps the only way to tell them apart is that one results in a better way of doing business. Survival in the new global marketplace calls on businesses of all sizes to spark and sustain innovative thinking within the workforce. To do that consistently depends on actively engaged business leaders who are able to intelligently deploy elements of what is traditionally considered play. That includes activities such as drawing, writing what-if scenarios, fleshing out conceptual designs, building working models, guiding collaborative flights of fancy and throwing out all assumptions. LEGO Serious Play (LSP) represents one of the best starting points to arrive there, based on a combination of the latest findings from top business and design schools with C-level industry experience and top performers in management consulting. Whether you need to improve your ideation, align your internal communication or succeed in co-creation with your customers, these are very productive innovation tools to use. LSP is designed to improve business performance at the intersection of hands-on and “minds-on” learning. One of the most useful introductions to this process involves a facilitated group dedicated to problem-solving. Team members answer complex questions by building 3D LEGO models to communicate their understanding of the topic. The various models form the foundation of deeper investigations, knowledge transfer and framing the best case solutions. The science of LSP has become well established over many years of research. The last point is the most salient for many businesses. LSP training makes it easier for people with complex ideas to communicate with their peers, and people tend to stay more focused on problem-solving. Advanced concepts within the digitalisation space are easier to make with a presentation to stakeholders using LEGO models. Another good example of how they can be instrumental is for the illustration of consequences, with external macro-analysis tools like PESTLED. Management specialists often use PESTLED as a shorthand for the political, economic, social, technological, legal, environmental and demographic implications that need be considered before embarking on large-scale innovations. Many businesses use a PESTLED analysis to fill in the Opportunities and Threats sections of SWOT frameworks with more robust specifications. Innovative projects in the H1 and H3 Horizon are considered different in some ways. For example, H1 addresses core business while H3 is all about new ventures. However, they do have one thing in common: both can be improved with the LEGO approach. In both cases, top architects, designers, C-Suits, engineers and many others have used LSP to address functional enhancements in team openness, co-creation, prototyping and ideation. Team-building activities featuring a LEGO challenge can teach cooperation, group dynamics and conflict resolution in a constructive environment. H1 calls for a “Spiral Staircase” form of leadership, where the organisation work step-by-step toward a well-defined goal. The tactile certainty of a LEGO model makes it easier for the team to share a single concrete model as a basis for their concerted efforts. The key metric here is ratcheting up ROI for existing products and services. Similarly, ventures in the H3 Horizon will benefit from LEGO models initiated by a leader who has assumed the Explorer style. That translates into openness, investigation, questioning, following leads and bringing in external knowledge from the edge of practical technology. Team members can build their own LEGO models of the most abstract ideas, to facilitate understanding and instigate ideation. Metrics for H3 projects are harder to pin down because they are so speculative, but each scenario should be highlighted with its own Strategic Option Value. If you want to dig deeper and surface more advice on organising for simultaneous innovation across horizons, details are available here. 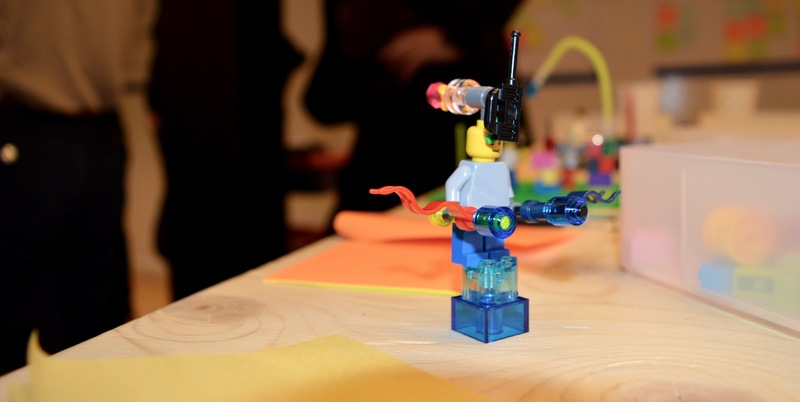 Creative leaders have turned to LEGO for more than LSP though. The Innovation360 Group has used LEGO bricks and similar materials in several projects. Recombinant manipulatives help people build what they see in their imaginations, fostering co-creation with customers or internal prototyping. From business model innovation to user experience to disruptive service offerings, LEGO models make visions into something tangible. They bring everyone on board with the singular version of truth so they can coordinate their skills more productively.